This is such an informative and well reviewed course you have here. I like the idea of meditation, and getting into your under spiritual self for the traumatic and emotional experiences side of it. I like that it’s really focused and extensive over 6 weeks of learning material, and with 15-20 minutes, that’s more than enough time to reap the benefits. Up to this point I do mostly yoga with the added benefits of mediation with Vinyasa therapy for pain related reasons and for more mobility, but if I need work on the other aspects of me, I’ll definitely keep this in mind. Thank you for sharing a great post! Hey Michael, the sutra practice is from the yogic traditions, so you might find it is a nice extension of what you are already doing. Yoga is such a huge science and there are so many aspects to it. Great that you are already doing some form of yoga! Got to admit, Deborah sure knows how to pose! I love meditation and I think I’m in need of finding myself spiritually, I’ve been too busy with work and after so long of doing the same thing again and again, I’m starting to feel as though I’ve lost my will to work. I remember how motivated I was and full of energy to work but somehow, that seemed to have changed and I do not know why. I mean I still have the same exact goal I used to have last year, but my drive i fading. 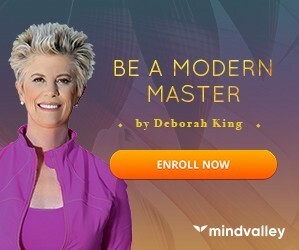 I’m not sure if this i normal, do you think Deborah’s program is for me? I think whenever you feel as you have described, it is always good to change up the routine and introduce something new into your life. If you are interested in esoteric meditation, then yes, I think this course would be fantastic for you. However, as I said, I think you have to be pretty open minded for it as it comes from quite a different perspective than western thinking. But that is one thing that makes it really interesting. If you allow yourself to suspend disbelief from just a while (e.g. 42 days) then you might just learn something about yourself and the world that you never considered before. An interesting course review, Liz. I especially like your explanations of your reactions to the challenging-for-you bits of information that the course presents. I agree that very often we westerners do need to have traditional esoteric practices after they’ve passed through the filter of a more western viewpoint. Without the grounding in these traditions, the concepts can be a lot confusing. Hi Netta, thanks for stopping by! This sounds strange to me but I must say that I’ve learned a lot of new stuff from your article. Every statement you have written here is new to me and I had to keep on repeating to make sure I understand what you actually mean. Your article is packed with well detailed information. Thank you. Does it mean that through meditation I can deal with my childhood traumas like Deborah as you stated or is anything connected with personal believe and faith? I will need to follow you up for more articles on this. Hi Paul. Yes it does mean you can deal with childhood traumas without having to re-live them. Meditation has a huge amount of benefits which has so much scientific evidence behind it now where you are literally retraining your nervous system to respond differently to the stress of every day life. We all have a certain amount of trauma in our life-this is just part of being alive.However, problems in our every day life crop up when the imprint of the trauma left in our nervous system is so great that our perceptions about life are altered to a state where it may not be productive for us. When you go into meditation, it is like you a resetting your nervous system to a more relaxed state. The catch with all of this though is that you have to practice every day. Each time you practice you change just a little bit more. It become a fascinating journey. If you have never heard about the benefits of meditation or never meditated in your life but are interested in learning, then you would probably be best taking on a more simple program that is not attached to a religious practice (this form of meditation is based in Hindu/Vedic teachings, it doesn’t mean you have to practice this religion, but if it does not agree with your belief system, then you may find it hard to embrace, however it does not take away from the mental emotional and physical benefits of practicing a mantra based mediation. But, there are so many ways to meditate and this is just one way). That sounds like a lot of benefits in 42 days. Have I read that correctly? That within 42 days you would be benefiting in all those ways? I will be looking forward to hearing what you think after 42 days. Will you be updating this page as well as your youtube channel? I have heard of mantras but not sutras so I shall enjoy finding out more about those. Hi Julia, well, all those benefits is the claim of the program which is why I am seriously testing it out. And yes, I will be updating my youtube and blog after 42 days with new a new post and video. I will say though, meditation is not something you ‘master’ in 42 days. It is a process. However, I think a serious kickstart to develop the habit such as a 42 day challenge will give the best chance of success, because life is all about the habits you build on as to what your level of success is going to be in any area. Focus is really hard for us these days with the amount of distractions we have going on around us! Stay tuned for my results! I have been trying my hand at meditation for a while now, with some success, but I’m pretty much a beginner. I really appreciate how well you broke this course down, and I’m grateful to you that you really went over not only who the course is for, but who the course is not for. I believe I may, unfortunately, fall into the “not” category on this one. I really appreciate your honesty and that you didn’t just try to sell the course. Thank you so much. My pleasure Babsie! Glad I could help you make a decision on this one! Thank you for this very comprehensive review. I haven’t heard about Deborah nad the sutra online course before. This is very interesting that it claims to be more than an ordinary meditation and I saw a comment of yours where you said it is from yogic tradition. I online tried a little bit of meditation before and I am currently practicing yoga merely because of my pregnancy. So, im really excited to see your updates after you have finished the course with Deborah. Maybe I would be willing to try it if you’ll great results. Hey Che, yoga is great for pregnancy-but hopefully you keep practicing after your pregnancy too! I have found that since becoming a parent I need stress relief more than ever. Not sure if you already have a child but I find that parenthood is so demanding! Stay tuned for my results-so far my biggest challenge is actually getting the meditation in before my 4 year old wakes up. I’m a really big fan of meditation and it has helped me immensely this year, even just a 10 minute meditation leaved me refreshed and relaxed. 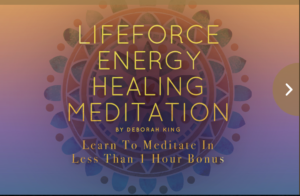 When you say that this course might not be for someone who wants to learn meditation just to relate, how much experience would you say one needs before knowing they are ready to take this course? Hi Darren, I feel it really depends on what your belief system is. It would be fine for a complete beginner, but if you are dubious when someone mentions ‘spirit guides’ and ‘inter-dimensional realities’, you may want to look at another meditation course such as perhaps TM meditation. So far I have found the simple mantra approach with the sutras tacked on at the end very different to other kinds of meditations I have tried, but meditation and spirituality has been a journey for me in that little by little I have become more open minded to consider what spirit might actually be and what lies beyond our physical realm. So, if you are looking to expand your mind and explore these possibilities, this course would be right for you. However, like I said in the review, if all you want to do with meditation is learn how to relax more, then I’d be trying another form of meditation. I think that it is great to be able to listen to it on your smart phone as well so that you can take it with you. So many people are always on the go. How do you find time in a busy day to stop and do these courses?How is it working for you so far?I think that meditation is a great way to relax. To be honest most of the time I am not sitting down to watch these courses. I am listening while I am doing something else such as walking the dog, driving or cleaning or cooking. 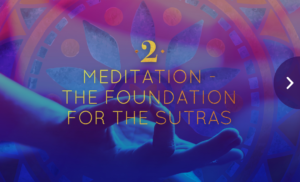 When there really is a requirement to sit down and focus, the course really only requires 15 mins or so a week-other than practicing the actual meditation itself of course which is 15-20 minutes first thing in the morning. So, all in all it is fairly easy to blend into my life. The hardest part is actually doing the meditation lol! 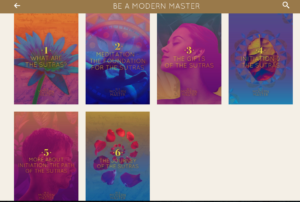 Hi there and thanks for a very comprehensive review of ‘Be a modern master’. It’s cool that this course has been developed to enable westerners to understand the ancient methods. Not everyone has time to travel to India several times a year. It would definitely take a commitment to complete the 6 week course, but around 15 minutes a day is not too much time out of a busy day, particularly if added on to the end of an existing yoga practice. Hi Ann, yes I am not finding it is much of a time investment at all. However, what I am finding is that it is making me re-think my daily routines in general. For example, I have begun to think I want to rearrange my mornings to not only include meditation, but also exercise and positive intentions for the day. It has been an interesting exercise so far to track my progress on my 42 day tracker and also note down my reflections for each of the days. I have found this is actually really important to do because the changes I am noticing are subtle and if I didn’t write my observations down I might have concluded not much is going on. Thanks for stopping by my site!